This Lagoon 410 S2, built in 2006 is an excellent choice for those wishing to experience a new sense of freedom in style and comfort. Wake up to the sound of the sea in one of the Lagoon 410 S2’s 5 spacious and modern cabins. 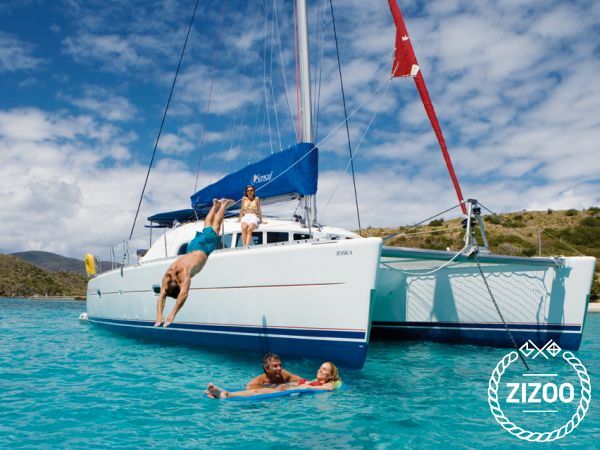 Sleeping up to 10 people, this catamaran is perfect for sailing with friends and family. The Lagoon 410 S2 is located in Marina Lefkas, Lefkas, a convenient start point for exploring Greece by boat. Happy sailing. Alles in allem top Service. WUrde bei Abgabe ausgiebig besprochen. Charter a yacht in Greece and experience the beauty and wonders of a nation made up of 6,000 islands and over 13,500 km of inspiring coastline. Meander from island to island, stopping for a swim in the gorgeous bays or to discover ancient ruins before catching the breeze to sail to your next destination. Requested 31 times this week!